A pathological increase in angle of torsion is called femoral anteversion, and a pathological decrease in the angle or reversal of torsion is known as femoral retroversion. The human hip is a modified spherical (ball-and-socket) joint. Thus, the hip possesses three degrees of freedom of motion with three correspondingly arranged, mutually perpendicular axes that intersect at the geometric center of rotation of the spherical head. The transverse axis lies in the frontal plane and controls movements of flexion and extension. An anterior/ posterior axis lies in the sagittal plane and controls movements of adduction and abduction. A vertical axis that coincides with the long axis of the limb when the hip joint is in the neutral position controls movements of internal and external rotation. Surface motion in the hip joint can be considered as spinning of the femoral head on the acetabulum. The pivoting of the bone socket in three planes around the center of rotation in the femoral head produces the spinning of the joint surfaces. There are two angulations made by the head and neck of the femur in relation to the shaft. one angulation (angle of inclination) occurs in the frontal plane between an axis through the femoral head and neck and the longitudinal axis of the femoral shaft. The other angulation (angle of torsion) occurs in the transverse plane between an axis through the femoral head and neck and an axis through the distal femoral condyles. If the axis through the femoral condyles lies in the frontal plane, then the head and neck of femur are torsioned anteriorly, relatively, on the femoral condyles. The angle of torsion decreases with age. In the newborn, the angle of torsion has been estimated to be 40 degrees, decreases substantially in the first 2 years. 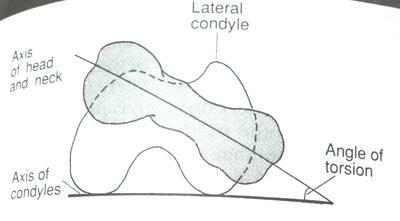 In the adult, the normal angle of torsion is considered to be 10-20 degrees. Although some structural deviations such as femoral anteversion and coxa valga are commonly found together, each may occur independent of the other. Each structural deviation warrants careful consideration as to the impact on the hip joint function and function of the joints both proximal and distal to the joint. Femoral anteversion is often implicated in dysfunction of both knee and foot. The other pathological angulations of the femur (retrovulsion, coxa vara and coxa valga) similarly affect the hip joint and the other joints proximally and distally.